The Hubble Space Telescope captured this striking image of the curious planetary nebula NGC 6210, which is located about 6,500 light-years away in the constellation of Hercules. A star's last gasp at the final stage of its life has been frozenfor all time in a new photo by the Hubble Space Telescope. At the heart of NGC 6210 is a star slightly less massivethan our sun that is in the last fitful stage of its life cycle. 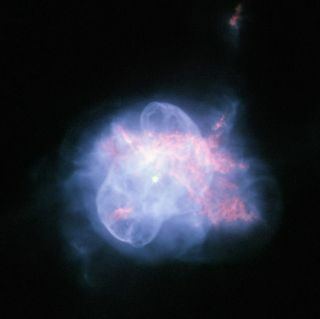 The star'sdeath spasms have kicked off multiple shells of material with different degreesof symmetry, giving the NGC 6210 nebula its odd, bulbous shape. The new Hubble image shows the inner region of the planetarynebula in unprecedenteddetail, where the central star is surrounded by a thin, bluish bubble thatreveals a delicate filamentary structure. The glowing bubble appears to beintertwined with an asymmetric, reddish gas formation where holes, filamentsand pillars are clearly visible. Planetary nebulas are shells of gas and dust expelled bystars near the end of their lives. They are typically seen around starscomparable or smaller in size than the sun. Planetarynebulas are not related to planets as their name suggests, but insteadearned the moniker because they resembled giant planets when viewed throughearly telescopes. A star's life ends when it runs out of fuel for itsthermonuclear engine. The estimated lifetime for a sun-like star is about 10 billionyears. When a staris about to die, it becomes unstable and ejects its outer layers to form aplanetary nebula. What's left behind is a tiny, but very hot, star remnantknown as a white dwarf. The white dwarf inside NGC 6210, which is visible in thecenter of the Hubble image, will cool down and fade very slowly. According to stellar evolution theory, our own sun will experiencea similar fate in approximately 5 billion years. NGC 6210 was discovered in 1825 by the German astronomerFriedrich Georg Wilhelm Struve. While it appears as only a tiny disc whenviewed by a small telescope, the planetary nebula is actually fairly bright. This picture was created from images taken with Hubble'sWide Field Planetary Camera 2. The Hubble Space Telescope has been scanning the cosmos formore than 20 years. NASA launched the iconic space observatory in April 1990. Since then, several space shuttle missions have visited thespace telescope to make repairs and upgrade its instruments. The fifth andfinal shuttle flight to overhaul Hubble occurred in May 2009.